Home baking is all about play of ingredients available at home. A little experimenting and a little creativity sometimes gives astonishing outcomes. Heavy fog has restricted the denizens inside home in this part of the world. With almost no activity outside, this is the best time to read a book that was always awaiting to be finished, complete chores that always bothered, but, were never a priority or try out something new in the kitchen. The latter option is always comforting and interesting, shifting attention from the vagaries of weather, and is a good way of utilizing time that always seems to be in excess in extremities of weather. 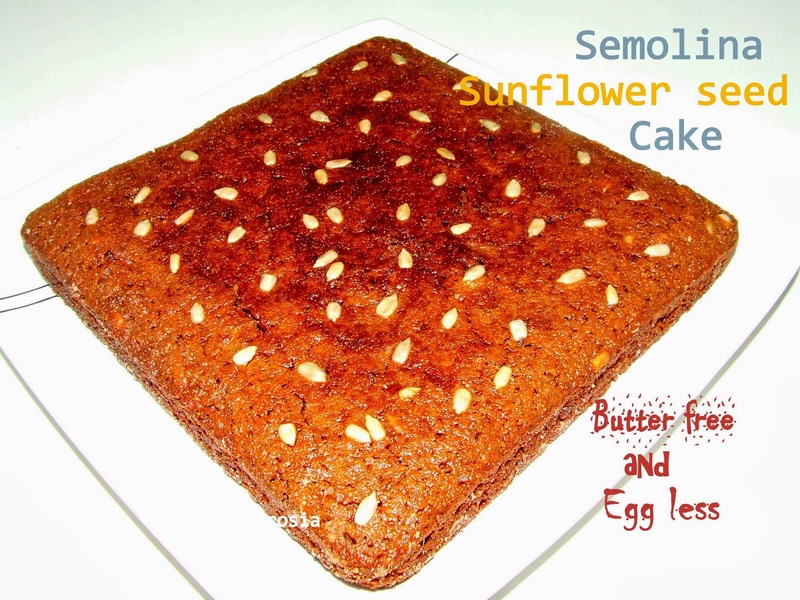 During one such day, I made Semolina Sunflower seed cake with the healthiest ingredients that I could find in my pantry. With no butter and eggs, this is definitely a guilt free cake and goes very well with a hot cup of tea or coffee. Mix semolina, milk and curd in a bowl. Cover and keep for 1 hour. Preheat the oven to 180 degrees C. Grease, dust and line a square cake pan. Add brown sugar, salt, vanilla essence and mix well. Reserve 1 teaspoon sunflower seeds to sprinkle on top. Fold in the rest of the sunflower seeds. Pour in the prepared tin and sprinkle the seeds. Bake for 30 to 35 minutes or till a skewer inserted in the center comes out clean. Remove from the pan after 10 minutes by running a knife along the edges. Cool in the rack. 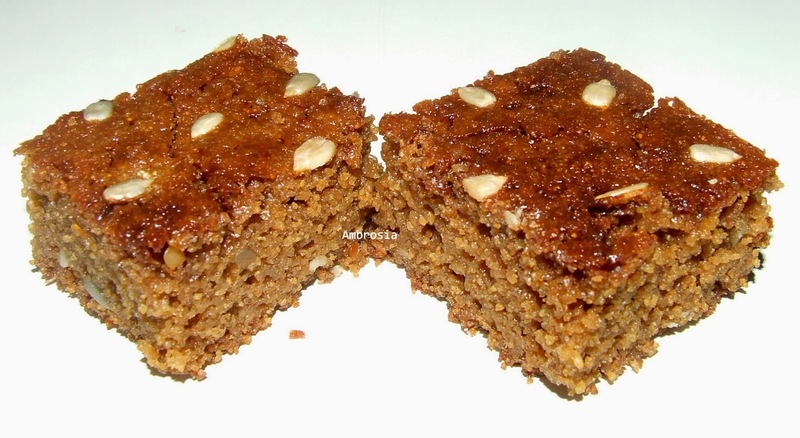 lovely cake with semolina and sunflower seeds. Hello Binu, You may roast semolina but it is not required. You may use raisins, cranberries or nuts of your choice. Do check out other semolina cake recipes in my blog. I am sure that you'll love them!